80 litre combi model - fridge & freezer at the same time. The MT80FC-P is the largest addition to the legendary ENGEL Combi Fridge/Freezer range. This Model has a huge 75 litre capacity (42 litre fridge & 33 litre freezer) with all the efficency and reliability you have come to expect from Australia's best portable fridge/freezers. The many quality features include a digital cabinet temperature readout for constant monitoring of the freezer temperature, steel cabinet, stainless steel hinges, steel handles & steel lid for durability and auto switching between AC and DC power. Three Year Warranty. 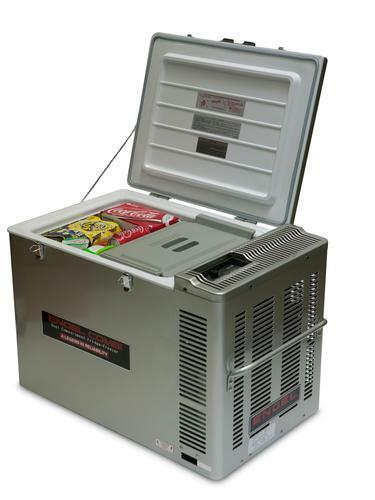 (In some instances, although it will cost more initially, it can be a better option to purchase two 40 litre units and use one as a fridge and one as a freezer .... this combination will use less power than the one 80 litre combi unit and give you the flexibility of only using the one smaller unit when going on a short or weekend trip). NB: Add additional 45-50mm each end to width for handles. Price: $2049.00 RRP Engel fridge only. $1855 with genuine Engel transit bag valued at $285 included Free of Charge. Phone or email for your Special Price.